A killer shark terrorizes a small seaside town during its financially busiest time of season, with a much-hyped regatta, and it is up to a cop and shark expert to stop it against the wishes of the mayor. No this is not a review of Steven Spielberg's Jaws or Enzo G.Castellari's L'ultimo squalo, but they do have identical plots. Unfortunately, the comparisons do not end there either. 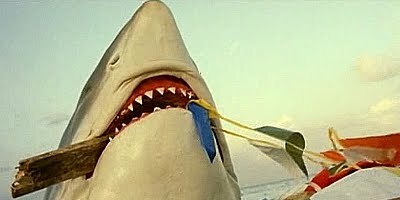 Cruel Jaws might be the biggest hack job ever committed to film, using key action and attack sequences spliced in from Jaws, Jaws 2, Jaws 3-D, Deep Blood, and the aforementioned L'ultimo squalo. Then again, this is a Bruno Mattei film, so there should be no surprise in the offending hack-manship involved. The only entertaining value that can be derived from this film is that the main protagonist freakishly resembles pro wrestler Hulk Hogan from the 1980s, the usage of John Williams' Star Wars soundtrack during certain scenes and the delivery of blatant rip-off dialogue such as "I think we're gonna need a bigger helicopter". The most unintentionally hilarious plot hole is that the villain is supposed to be a tiger shark when all of the footage used is obviously that of a great white shark. Cruel Jaws cannot even be classified as a "so bad it's good" feature, but can be classified as a waste of celluloid. If the film was played as a spoof, it could garner some appreciation. However, the film is played straight for 100 minutes and quickly becomes a giant borefest of a giant shark film. Marketed outside the U.S. as Jaws 5: Cruel Jaws.